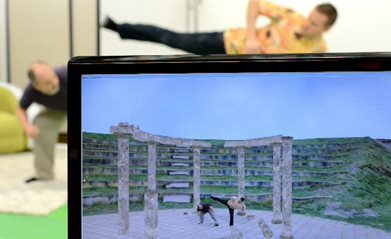 We’ve been working like crazy at Organic Motion on our RealityCapture LIVE product. It’s a real-time content creation platform for VR that we’re rolling out at TechCrunch Disrupt this week. Powered by markerless motion capture, people can step into our booth, capture full geometry and color information, and then stream that to VR. Check it out on the Organic Motion website or YouTube if for no other reason than to see me wearing a shirt covered in prints of hamburgers doing silly things. I’m not much of one to post pictures and information on the Facebook machines or wherever, but I do need to share some shots of little Vivian Kathryn aka Cupcake. Here are a couple; check her out. I’m excited to announce that Master Eric Bullock and I will be hosting a knife self-defense seminar at Ladd Family Martial Arts in a few weeks. Here are the details, and a link for the flyer. Time: Saturday, November 12 from 2:30 to 5PM. Registration will start at 2. I’ve been studying the Filipino martial arts with Master Bullock for some time, and that was my inspiration for this seminar. They’ve been an amazing complement to Taekwondo and now Tang Soo Do as primarily empty hand arts. Working with the cane and knife in Arnis classes has opened up a whole new set of techniques and knowledge. It’s something I wanted to share with folks. If you’re studying at a school in town, please come out and train with us on November 12. It will be a great learning experience and a lot of fun. If you have questions or plan to attend, please get in touch using the contact form on the right. I’ve been remiss in posting this update. 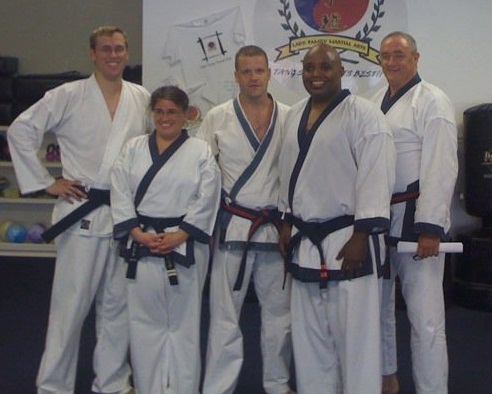 On August 13th, I tested for 1st Dan in Tang Soo Do with Master Jason Ladd at Ladd Family Martial Arts. I passed and now hold a Dan ranking in Tang Soo Do as well as Taekwondo. Here’s a pic of us after the exam. Many thanks to Master Ladd and Master Donnelly for overseeing the test, and I’d also like to thank Kyo Sa Santini and Kyo Sa Hubbard who tested for 3rd Dan. It was a great test, and a good experience for me to work toward a new Dan with them. The whole process has reminded me how much I love the martial arts and rekindled my fire to open a dojang one day. Ever wonder if there’s someone watching you. 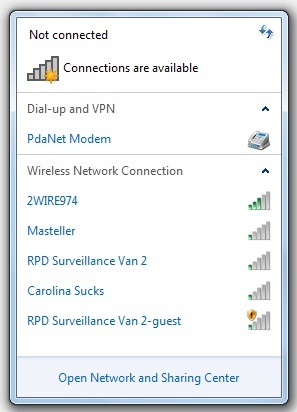 Well, I’d propose the Raleigh police department change their wifi network name if they wish to remain unseen. For Christmas, my mother-in-law had a brainstorm to get me some new sticks. She found these Kamagong (aka Ironwood) sticks on Amazon. I wasn’t familiar with the Kamagong tree until I got these, but there are some interesting facts on the Wikipedia page. Each of these sticks is about one pound making them significantly heavier than rattan or American hardwoods like hickory. I weighed a rattan stick for comparison, 7.5 ounces. For that reason alone, I would recommend these sticks. They are great for strength training. It’s much like swinging a weighted baseball bat before you get to the plate. I use them at least once a week to run through the 12 strikes and basic drills. Conversely, these sticks are heavy and solid enough to destroy any lighter materials they encounter. In fact, I have not tried nor would I not recommend using them for contact and striking drills with others unless they were swinging equally dense and heavy sticks. I can’t imagine a set of rattan sticks would last more than a couple of minutes. Length is 28 inches which is fairly standard, but might be longer than some folks want. The case provided is simple but quite nice. The velcro closure is strong enough to hold even if you sling them over your shoulder upside down. The nylon strap is easily adjustable but doesn’t slip once set. Mine is all black, but it looks like some pictures have colored trim which I think would be nice as well. Aesthetically, the wood is beautiful. It has a deep, rich color with a variation and undulation in the grain. I have a soft spot for woods and wood grain, so these hit the right note with me. Obviously, I think the weight of these sticks is a mixed blessing since it limits when you might do contact drills, but I always have a pair or two of rattan when I train so that’s not a huge deal to me. My only other criticism is that the sticks have been treated with what I presume is linseed oil (or possibly some natural wood oils from the tree). In any case, it leaves your hands a bit tacky when you’re finished. It’s worth noting as one of the downsides on an otherwise good product. I’m going to try to post more about martial arts and my training. There’s a new category for this if you just want to follow that information, and I have a dedicated Twitter feed for martial arts related stuff, @MasterAmerson. For those that take Arnis classes with me, that feed is where I’ll post status on Thursday night open floor workouts as well. The Only Boss You Can Ignore!